Mira and I just returned from a lovely month of touring in Florida. We met some amazing folks and had some truly blissful kirtans and workshops. We finished the tour in New Orleans at Wild Lotus Yoga. Below are some pictures in New Orleans - one with Mira and I in front of our friend and host Sean Johnson's parents home. 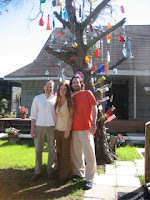 We are standing in front of a their "bottle tree"
There home had been destroyed in hurricane Katrina. Sean gave us a tour of the city and it was devastating to see how much of it is still in shambles. So, please send your prayers there! It was really powerful to sing Kirtan there! 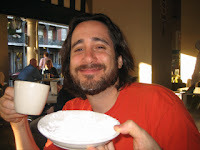 Also, is a photo of me after enjoying a New Orleans specialty called a "beignet" at the famous Cafe Dumond. These are square french donuts covered in powdered sugar. Yes you can see the smile on my face - can't imagine why? 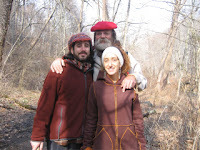 Lastly, is Mira, myself and Bhagavan Das relishing some down time in the woods by my house. Also, here are some great resources of folks that we met while on the road. - We played at The Ayurveda Health Retreat in Alachua, Florida where we were revived with panchakarma treatments. This is a very sweet and serene place run by a very loving being named Rasa. We highly recommend a visit here if you are looking for deep relaxation and renewal. - And our new friend Burton Richie did a podcast with us in Pensacola, FL. which was a blast (I'll keep you posted when it's up). Burton operates a very cool website called Everything Yoga that has lots of cool yoga supplies, clothes etc.. Check it out.